Jaggery popularly called Gur in India has amazing health benefits and uses. Jaggery has wonderful nutritional benefits and is good replacement for white sugar. Jaggery has been widely used in Ayurveda from ancient times. Jaggery is useful for pregnant women, babies, infants and is good for our hair and skin too. It can also be included in a weight loss diet. We make jaggery tea with dry ginger and coriander seeds at home and it is a wonderful remedy for cough and cold. Jaggery is a natural sweetener prepared from sugar cane juice. It is a non centrifugal sugar where the molasses and crystals are not separated. Almost 70 % of the jaggery produced is from India. Since jaggery making does not involve any chemical process, it retains the most nutrient value of sugar cane. Jaggery is reddish dark in color and though some manufactures use hydrosulphite to lighten the dark color of jaggery, we do get dark jaggery too. Jaggery has a much sharp taste and flavor than regular white sugar and most South Indian sweets are made with jaggery. We have a small jaggery making unit near our village and I love to visit it mainly to get fresh sugarcane juice. To make jaggery, fresh sugar cane is cut from the near by farms and the juice is extracted using a machine. The fresh sugar cane juice is taken in large vats and then boiled and constantly stirred with a long laddle. Once the desired consistency is reached, it is let to cool and then formed into rounds. The consistency of the jaggery is important else it will form moulds on top of it easily. Jaggery is the English name. Jaggery is called Vellam in Tamil, Bellam in Telugu, Bella in Kannada, Gur or Gud in Hindi, Bengali and Punjabi, Gurh in Sindhi and Urdu, Gol in Gujarathi and Rajasthani, Gool in Marathi, Vellam in Malayalam, Guda in Oriya and Gor in Kashmiri. 10 grams of jaggery contain around 38 calories. Jaggery contains around 70 % sucrose, 3 % moisture, 5 % minerals and vitamins and 10 % fructose and glucose. The minerals present in jaggery are calcium, magnesium, potassium, phosphorous, sodium, iron, manganese, zinc, copper and chloride. The vitamins present are vitamin A, vitamin B1, vitamin B2, vitamin B5, vitamin B6, vitamin C, vitamin D and vitamin E in small amounts. We get powdered jaggery in almost all the departmental stores in India. We use powdered jaggery while making jaggery tea. To make jaggery tea, boil jaggery powder with water till it dissolves and then strain to get rid of any impurities and boil again. Now pound a small piece of dry ginger and coriander seeds coarsely and add to the boiling jaggery water and switch off. Strain and your healthy delicious jaggery tea is ready! 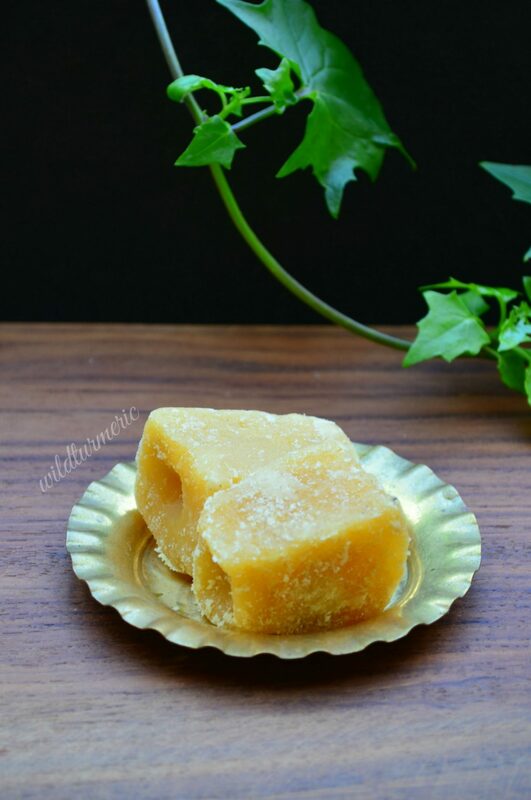 We call jaggery that comes in small cubes “Achu Vellam”. The word achu means mould, since the jaggery cubes are poured into small moulds, it is named achu vellam. 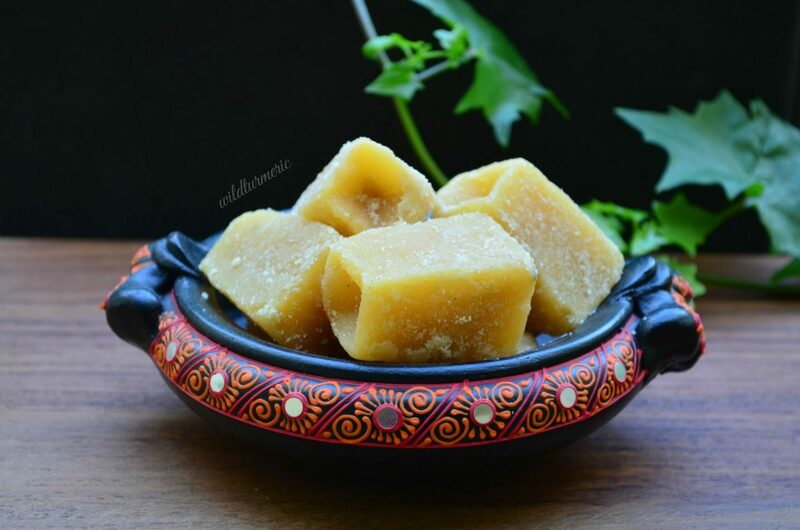 Achu vellam is easier to use than jaggery rounds because it is easier to break and use the required amount in recipes. The final type of jaggery is jaggery rounds, we call it “Urundai Vellam”, Paagu Vellam” and “Mandai Vellam”- all referring to the shape and the usage of round jaggery. 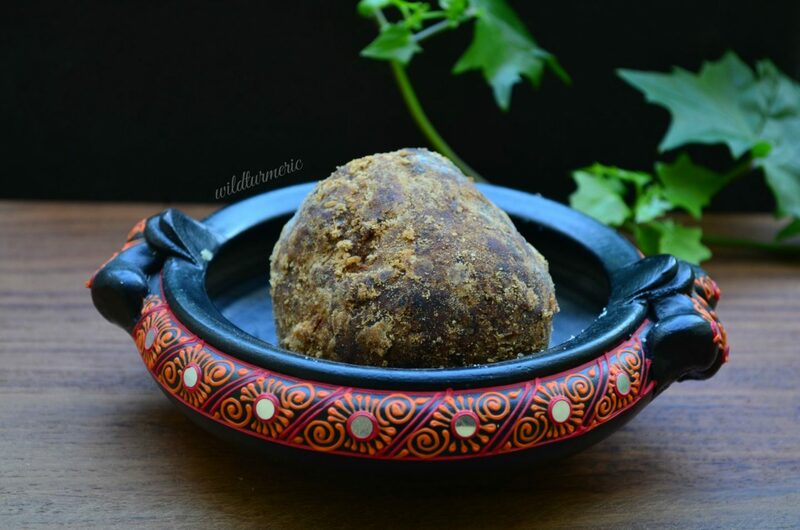 I always get jaggery rounds and stock it at home as we use it extensively in most Indian recipes. I break it using a pestle and then use the required amount in recipes after boiling in water and straining it. Jaggery has a much sharper taste compared to white sugar and here in our village, we always prefer sweets made with jaggery. Actually when we add white sugar in sweet recipes that calls for jaggery, the recipe will actually taste bland. Jaggery is a natural sugar and does not go through any chemical process whereas white sugar is highly processed. White sugar is devoid of any minerals and vitamins while jaggery has vitamins and minerals. Jaggery is rich in antioxidants and has some health benefits whereas white sugar does not have any health benefits at all and does only harm to us. We can get jaggery powder and round jaggery in all the departmental stores in India. Nowadays, we get jaggery online too. When you are buying jaggery, make sure to buy organic jaggery that is dark in color (like shown in round jaggery picture). Some manufactures add hydrosulphite to lighten the color of jaggery (jaggery cubes shown in the picture have hydrosulphite added to them) as some prefer light colored jaggery. I would suggest using jaggery without added hydrosuphite (some organic jaggery manufactures will mention it in the package). 1 kilo of organic jaggery costs anywhere between 220 to 250 rupees and the price usually varies slightly during the year. Jaggery is a good substitute for white sugar but it should not be consumed in excess. Though it has got mineral and vitamins and is not processed, it has got a GI of 87.4 which is still high so please have it in moderation. Also 10 grams of jaggery has around 38 calories so if you are on a weight loss diet please keep that in mind. At home, we try our best to use jaggery to sweeten beverages that we drink on a daily basis and restrict sweets made with jaggery (all our traditional sweets are made with jaggery) to special occasions. Personally I feel moderation is the key to consuming jaggery…. Compared to regular sugar which is devoid of any minerals, jaggery is rich in vitamins and minerals particularly iron. 100 mg of jaggery contains around 10 to 13 mg of iron. Traditionally jaggery is usually made in large iron vats which also helps increase the iron content of the jaggery. I have always considered jaggery to be a good alternative to common white sugar as it is rich in minerals and vitamins and have never considered it’s therapeutic properties. I was surprised to learn that jaggery has a protective effect on out kidneys and even protects us from accidental arsenic poisoning. This is due to the poly phenols and other biological compounds present in jaggery. You can read the study that supports this claim here. It is always best to limit sugar intake for kids too but if you want to use a natural sweetener use jaggery instead of white sugar. It is rich in antioxidants, in fact it has 10 times more antioxidants than regular brown sugar that we get in markets! When my son was a baby, I used to sweeten his ragi porridge with organic jaggery instead of regular white sugar. Here in Tamil Nadu, it is a custom to take sweets for pregnant women and usually they were traditional sweets like obattu made with dal and jaggery. When I was pregnant, my grandma used to be strict about me not eating too much sweets. To satisfy my sweet cravings, I used to have a tiny bit of traditional sweets made with jaggery. I would suggest the same to all pregnant women too. Some diabetic patients consume jaggery liberally thinking that it healthier compared to white sugar. Diabetic patients should remember that jaggery is also a sweetener just like white sugar. Since it is rich in antioxidants, vitamins and minerals, it can be consumed once in a while in very very small amounts. One of my relatives who is a diabetic consumes a small piece of his favorite sweet weekly once but made with jaggery so it does not spike up his insulin levels. Since jaggery is rich in iron, it is a good idea to replace white sugar with jaggery whenever we can. Many Indian women (almost 51 % of Indian women from the age of 15 to 49 years) are anemic and we have to take steps to increase iron content in our diet. One simple and easy tip to replace white sugar with jaggery. Jaggery is an amazing blood purifier and cleanser. Since jaggery has a protective effect on our kidneys and liver and also is rich in antioxidants, it helps improve immunity. Also usually jaggery is made without any added chemical additives so it is best to replace white sugar with jaggery. Today my aunt made coffee with organic jaggery for me and there was not much of a difference between it and the one made with white sugar. 10 grams of jaggery has around 38 calories so if you are on a weight loss diet, you have to monitor the amount of jaggery you are consuming but I would suggest replacing white sugar you are consuming in your weight loss diet (white sugar added to coffee and tea) with jaggery as it is rich in vitamins and minerals. Jaggery when consumed internally as a replacement for regular white sugar and as a external application will greatly benefit our skin. 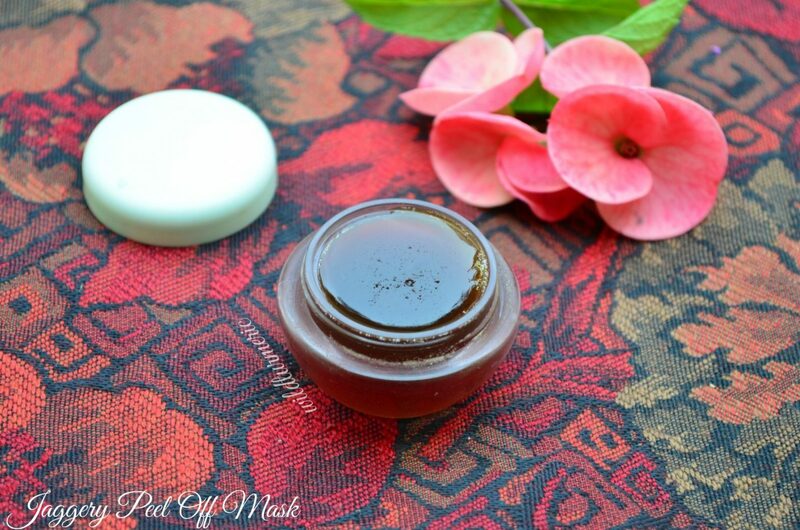 I make a glycolic peel off mask at home using jaggery that removes blackheads and whiteheads well. It also smoothens and softens the skin immediately. I was amazed the first time I used glycolic peel made with jaggery, it removed all my blackheads along with making my skin soft and smooth. You can find how to make it here.